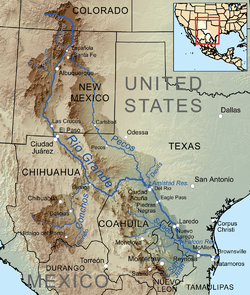 Rio Grande se yon gwo rivyè long 3037 km ak sèvi kòm yon fwontyè natirèl ant Meksik ak Etazini. ↑ Metz, Leon C. « Rio Grande ». The Handbook of Texas Online - access: 8 Out 2016. Paj sa edite a 10:25, 8 jen 2016.